The legacy continues. 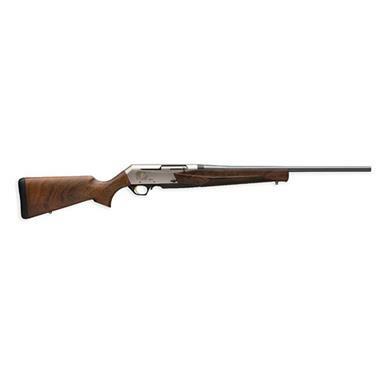 The original civilian BAR rifle was designed by Browning family member Bruce Browning. He designed it to be the standard for autoloading hunting rifles. The latest MK3 builds on that legacy with completely new styling, hammer-forged barrel, precision alloy receiver, and a fine oil finish Turkish walnut stock. Even those most skeptical about autoloaders will become an enthusiast after seeing the performance and accuracy of the MK3. Setting the bar for other autoloaders, the MK3 has no match when it comes to accuracy, speed, or caliber selection in a hunting autoloader. Add the detachable box magazine for quicker and easier loading, and you've a rifle you'll cherish for years to come. The MK3 is loaded with a ton of features for even the most inexperienced hunter. The receiver is constructed of aircraft-grade aluminum alloy for greater strength and durability. The bolt release lever is incorporated directly into the receiver. Contoured for use with scope or open sight, the fluted stock is undercut and incorporates a full pistol grip. The safety is of a crossbolt design and has an enlarged head. The barrel is constructed from heat-treated billets of steel and is hammer forged for greater accuracy. Look like the grandson may surpass the grandfather.